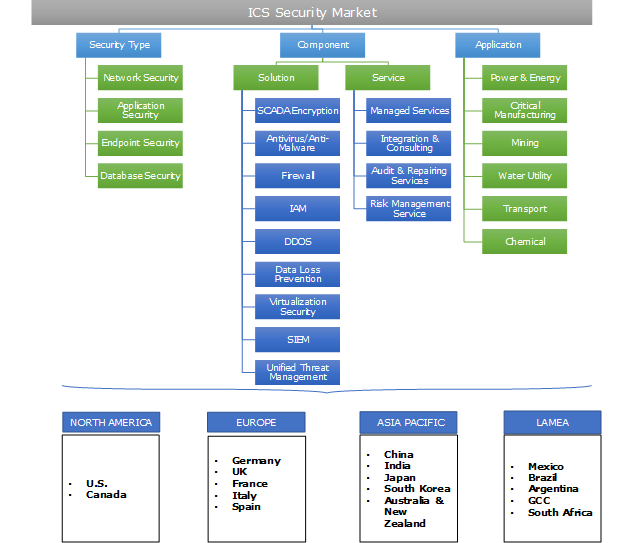 ICS Security Market size was estimated at over USD 1.5 billion in 2017, growing at a CAGR of 20% from 2018 to 2024. The ICS security market is witnessing an accelerated growth and is projected to register a robust growth over the forecast timeline due to the technological advancements in Industrial IoT (IIoT) leading to an increased deployment of connected components in industrial IT environments. Between 2015 and 2017, there was a significant increase in the number of vulnerabilities detected in ICS components in industrial sectors. Majority of the vulnerabilities were detected in SCADA/HMI/DCS devices amounting to nearly 30%, followed by those in network equipment which constituted nearly 28% of the overall vulnerabilities. In 2017, the number of vulnerabilities reported by major companies offering ICS solutions were 197, as opposed to 115 in 2016. Consequently, the demand for ICS security solutions increased during this period. Government initiatives to enable better security of national critical infrastructure are expected to increase the awareness regarding the need to fortify ICS environments against cyber-attacks. 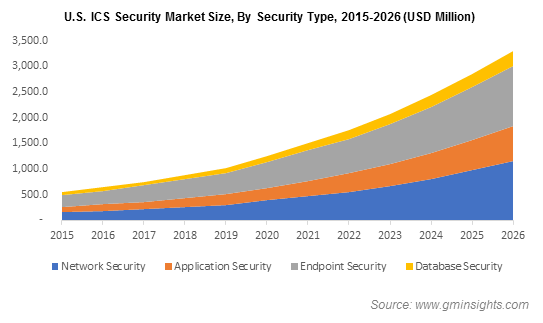 Network security segment is projected to register an accelerated growth in ICS security market between 2018 and 2024 with a CAGR of nearly 26%. Due to the increasing incidents of successful industrial network infiltrations by cyber-attackers over the past five to seven years, the demand for robust network security solutions among industrial sectors is increasing consistently. The June 17 NotPetya ransomware attack on industries in the U.S. and Europe was one of the major cyber-attacks on industrial IT networks in the recent years that resulted in losses of hundreds of millions of dollars for large enterprises such as Maersk, a shipping company that handles one in seven shipping containers globally. Identity & Access Management (IAM) solution is projected to witness a rapid adoption in ICS security market over the forecast timeline with the segment registering an impressive growth rate of around 25%. As these solutions ensure the prohibition of unauthorized access to critical infrastructure components, cybersecurity in the Operational Technology (OT) environments can be largely enhanced using IAM solutions. The service market is projected to exhibit the fastest growth between 2018 and 2024, registering a CAGR of around 35%. Due to the consistently evolving nature of cyber threats, such as ransomware and viruses, the need to constantly fortify cybersecurity solution is being increasingly recognized by the companies operating in the ICS security market. Hence the demand for services, such as managed services and integration & consulting services, is likely to increase over the forecast timeline. The transportation application segment in ICS security market is expected to exhibit a robust growth between 2018 and 2024 with a CAGR of around 26% due to the increasing awareness related to ICS security for protecting critical transportation networks such as highway, surface transportation, aviation, maritime, and pipeline. Maritime transport component, such as ports, vessels, and waterways, plays a critical role in facilitating large-scale trade operations. Hence securing these systems is highly essential to ensure the smooth functioning of vessel and port operations. The rail freight transportation sector is also an emerging market for ICS security as regulatory bodies are focusing on determining cyber risks associated with rail transport systems to identify ICS cyber evaluation metrics. The Asia Pacific ICS security market is projected to register a lucrative growth during the forecast period due to the presence of several SMEs in the region focusing on delivering ICS security solutions to the major vendors operating in the market. Also, the growing rate of urbanization and industrialization in rapidly emerging economies, such as India and China, is expected to further contribute to the market growth between 2018 and 2024. The LAMEA ICS security market is estimated to exhibit the fastest growth between 2018 and 2024 with a CAGR of nearly 30%. The expanding energy industry with massive investments in oil & gas energy infrastructure for exploration and production activities will facilitate the increasing uptake of ICS security solutions in the region over the forecast period. The competition in the ICS security market is characterized by diverse product offerings from major system vendors as well as pure providers in the cybersecurity landscape. The major system vendors emphasize on product development and strategic partnerships with cybersecurity vendors to offer enhanced protection to their customers operating in the critical infrastructure sectors. The companies specializing in cybersecurity solutions focus on product innovation to incorporate the latest cybersecurity capabilities in their solutions to mitigate the risk of evolving cyber threats. Some of the key players operating in the ICS security market are BAE Systems, Cisco, ABB, Cyberbit, Belden, Fortinet, Dragos, Honeywell, Rolloos, Raytheon, SecurityMatters, Trend Micro, Claroty, Symantec, IBM, Kaspersky, FireEye, Schneider Electric, General Electric, McAfee, Nozomi Networks, and Bayshore Networks. Industries operating on critical infrastructure have fallen victim to increasing cyber-attacks in the past five years. Securing critical infrastructure from consistently evolving cyber threats has emerged as a prime concern for industries such as oil & gas, marine, energy, utility, and manufacturing. As manufacturers are focusing on the design and development of new control systems to replace the legacy systems used traditionally in the industries, the need for implementing ICS-specific security technology in such systems has largely increased over the past five years.